In response to a proposed guidance from the state’s Board of Education that would pressure schools to let children choose their gender-assigned bathroom of choice, Michigan parents, teachers and students have flooded the Board with pleas to change the policy. At time of writing, almost 6,000 comments had been submitted to the Board of Education on EveryVoiceCountsMi.org, far more than the dozen or so comments usually left on proposed policies. Many of those commenting on the guidance are mothers afraid for their daughters’ safety and privacy, some accusing the Board of inviting sexual harassment upon young girls. One commenter pointed out that many of Michigan’s smaller school districts have middle-schoolers and high-schoolers all in the same building. “Are you really encouraging a 12 year old female-to-male transgender to share a bathroom with an 18 year old male who will be using a urinal?” the mother wrote. 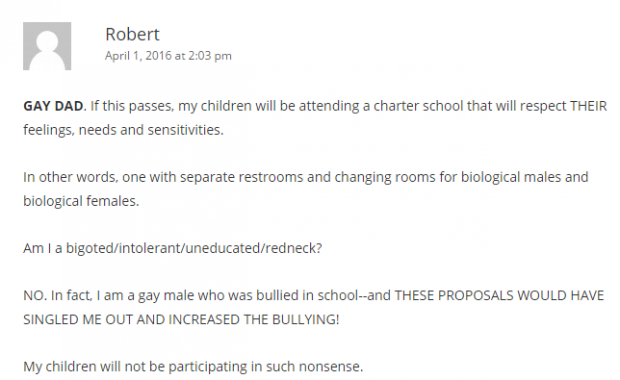 Another commenter, who identified himself as a gay father, called the proposed guidance “total nonsense” and said that his children will be “attending a charter school that will respect THEIR feelings, needs and sensitivities” it passes. The Board of Education, which contains three times as many Democrats as Republicans, will decide on May 11 whether or not to push forward with the guidance.